We’ve been serving Southern California as the most established and qualified domestic services agency since 1983. Nothing is more important than the care of your children. Find out what makes our nannies so special. Housekeepers, Elderly Care, Estate Managers, Chefs, and More. We can fulfill all of your personal staffing needs. Since 1983, OC Nannies & Newport Domestic Agency has provided Southern California families with experienced and qualified domestic workers. Through honesty, hard work, and skill, we have become the most trustworthy and reliable agency in Orange County. 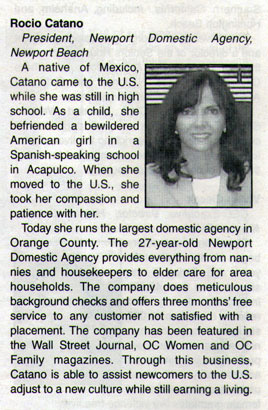 OC Nannies & Newport Domestic Agency has been in business in the personal staffing industry since 1983. 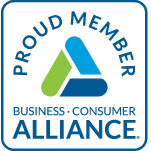 We have a triple-A rating with the BCA, and have been nominated as the best agency in Orange County on several publications, including Parenting OC Magazine for six years in a row. Our counselors are available Monday through Friday, 8:00 AM to 5:00 PM to serve you and answer any questions. Winner of Parenting OC magazine’s, Readers’ Choice Award for “Best Nanny/Babysitting Service” in Orange County, 6 years in a row! Hiring a Nanny or a Caregiver is not easy. Families that have tried doing this on their own or through an online service have failed to find the quality caregiver they are looking for. We make it easy for you by selecting among applicants that we have met in person, and have been screened very carefully for your specific needs. Our clients are astonished to find so many excellent candidates in one single interview. radio interview with OC Family. OC Nannies quickly provided us with great candidates to fill our nanny position. Excellent and professional service.